Turkey In 2018: Where To Go Next! 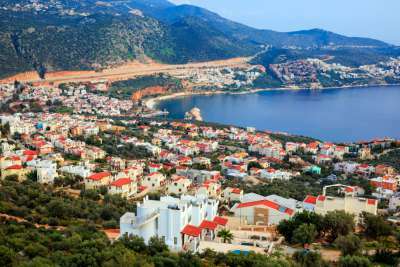 A historical town set along Turkey's stunning Lycian Coast, Kalkan benefits from charming surroundings without the hordes of tourists that some of the bigger destinations draw in. 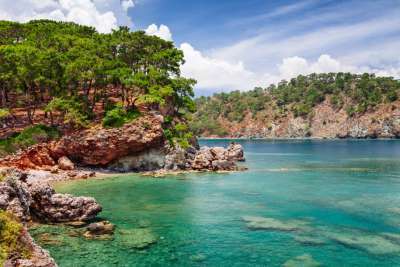 With crystal clear and mostly calm waters, Kalkan's main white-pebble shore is a pleasure for visitors wanting to do a spot of snorkelling on their holiday. Foodies will also be happy with the vast amount of restaurants on offer in this exciting resort, all with an abundance of fresh produce and local delicacies to get stuck into. 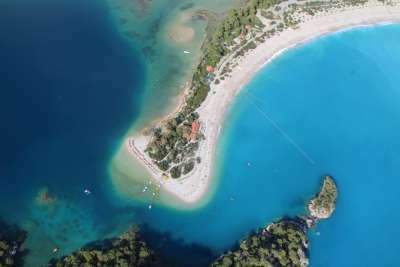 Home to Turkey's famous Blue Lagoon, and set against a dramatic pine-covered mountainous backdrop, Olu Deniz fronts many an idyllic postcard. Get the best views of this gorgeous resort via a daring, but oh so popular, paragliding flight. You'll need to leap off of Babadag Mountain to do so though, so if you prefer your feet firmly on the ground then why not relax on the sandy Blue Flag-winning beach instead? Grab a cocktail and soak up the sights and the sunshine all day long. 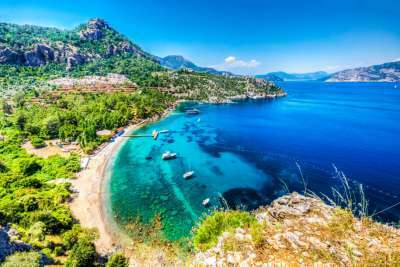 From beaches and baazars, to national parks and nightlife, if you're looking for a resort with a bit of everything, then maybe Kemer is the place for you this year! A modern marina sits between a choice of two lovely beaches, and it's here you'll want to remain, ready for the evening when the resort comes alive. Choose from live music venues and cocktail lounges, all the way to pool bars and bouncing nightclubs. There's also some pretty great restaurants, with the more upscale establishments sitting nearer to the marina. An hour away from the city of Antalya sits gorgeous little Side. 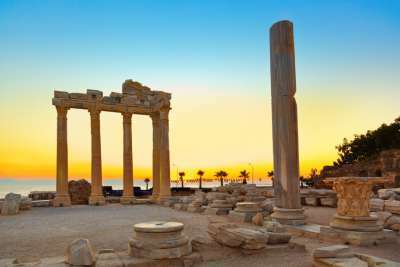 The history very much dominates this Roman-inspired resort with the 2000 year old Temple of Apollo still standing tall, and a huge amphitheatre still in use to this very day for summer concerts. The contrast between this and Side's chic harbour, lined with restaurants and buzzing bars, makes this Turkish destination pretty unique in its own right. There are also two sandy beaches to pick from. One benefits from shade and shallow waters, making it a top pick for families. With beautiful golden sands, a castle built by the Genoese in the heart of town, and a vibrant harbour, Cesme is a great option for holidaymakers looking for an alternative to their usual Turkish resort. Set on the western coast, temperatures in the summer months quite often reach into the 30°Cs, with the winters also remaining mild and pleasant. The town has maintained its traditional character, with lots of history to be explored. However, with all that sunshine we wouldn't blame you for just wanting to plonk yourself down and take in all that lush green countryside around you! Beach-lovers, this one's for you! 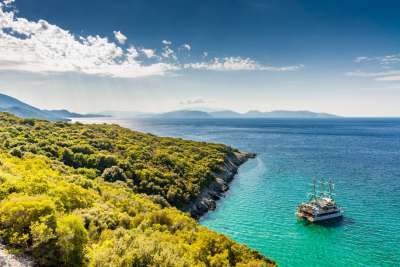 With a choice of eight stunning beaches, relaxing in Kusadasi is easy to do. Head to Kustur Beach is you want a quieter option away from the crowds, however if it's watersports and liveliness you're after then Ladies or Long Beach might be more up your street. For family fun, why not head over to one of the three waterparks all within easy reach of Kusadasi? And for those looking for a good night out, this resort is well-known for its great nightlife, with a wide range of bars and clubs to enjoy. 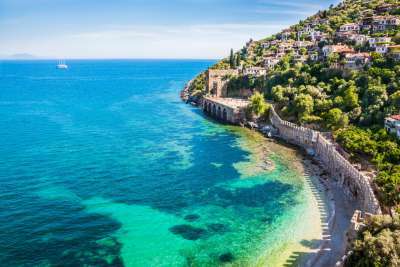 Alanya is a seaside town on the southern coast of Turkey well-known for its buzzing nightlife. Generally clubs and bars get going around 11pm, and there's plenty of opportunity to party into the early hours with a super-club just outside of town, easily reached by shuttle bus. If your hangover the next day will allow it, there's also loads of history and beauty to see in this town, away from the party atmosphere. Iconic Alanya castle and the Red Tower shouldn't be missed, and a trip out to Sapadere Canyon is also well worth a visit. 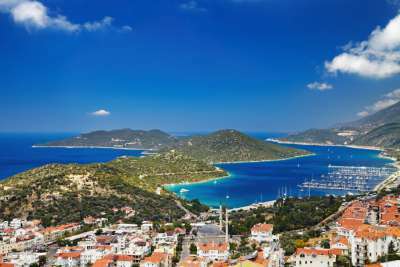 With white-washed buildings climbing down lush green mountains, the charming little village of Kas could be the place for you if Turkish tradition and beauty is what you're after. Things are pretty laid back here, with waterfront coffee shops, adorable winding streets, and quaint little beaches for soaking up the sunshine on. Diving is a popular pastime here in Kas with excellent visibility and plenty of fish and turtles to swim alongside. If you prefer to be on top of the water, there are several boat trips on offer that travel to Kalek and the Blue Caves. Another peaceful Turkish resort, Turunc is fantastic for couples and families looking for a more tranquil holiday. A hidden gem on the popular Turquoise Coast, Turunc is home to a gorgeous Blue Flag beach backed by stunning rural surroundings, making is very easy to kick back and just relax. Lined with waterfront bars and restaurants serving local dishes, it's a lovely spot to just sit and watch the world go by. If you happen to be around on a Monday make sure you check out the weekly village market selling a range of local produce, souvenirs, and handmade goods. 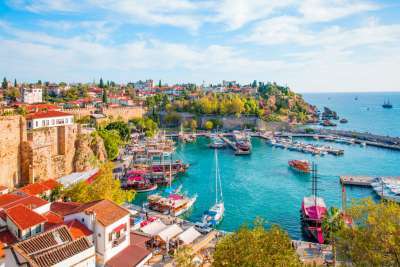 The fifth-most populous city in Turkey, Antalya is loved by many for its gorgeous marina, vast array of restaurants, bustling nightlife and historical attractions, not to mention its white-sand beaches and secluded coves. It has a lot going for it, which is probably why it's incredibly popular with tourists and locals alike. For a taste of the region's more traditional side head to the backstreets of Antalya's town where you'll find kebabs sizzling, impressive Ottoman architecture and plenty of bartering going on.